Editor’s Note: There are spoilers in this review for Far Cry 5. You have been warned. When the credits rolled on Far Cry 5 last year, I was a little confused and angry. No matter which decisions you made, both endings seemed intended to hammer home the futility of your actions. Regardless of what you did for the rest of the game, Far Cry 5 ended in the apocalypse predicted by The Father, the cult leader who stood as the antagonist of the game. It was such a striking set of endings that I was left wondering what Ubisoft was trying to say. Was the Father right? 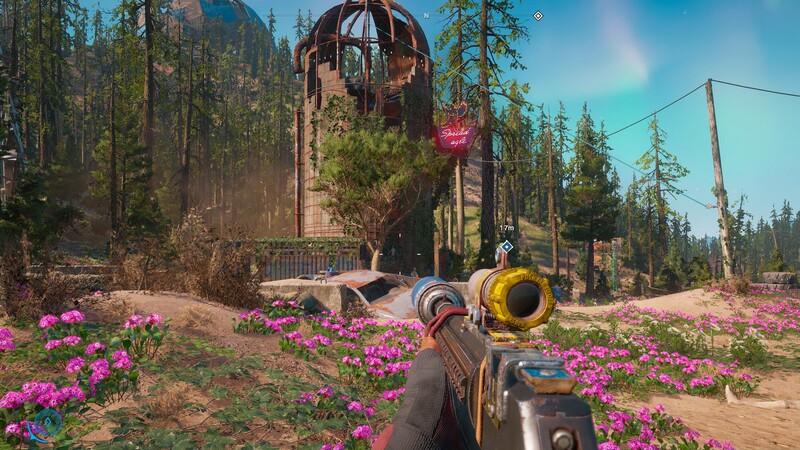 Far Cry: New Dawn is the answer. Ubisoft is selling and marketing this as a standalone Far Cry title that just happens to connect up to Far Cry 5. The truth is that both games go together. New Dawn is the proper ending to Far Cry 5. Yes, it’s standalone, with new antagonists and supporting characters, but it carries forward from its predecessor. 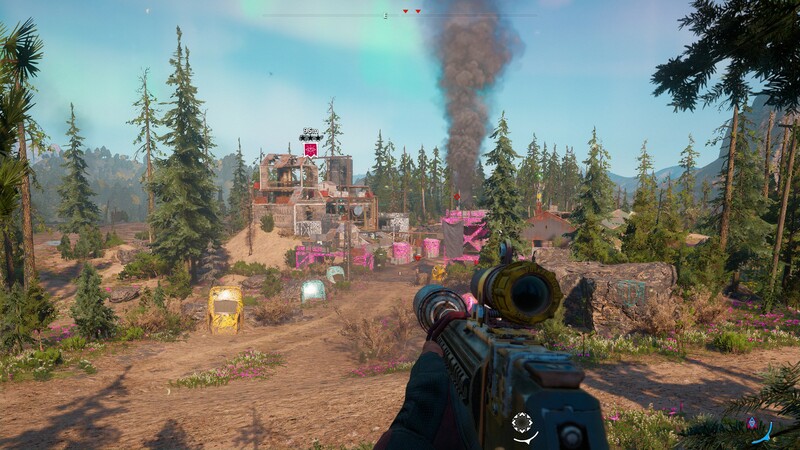 The story of Far Cry: New Dawn picks up in Hope County, Montana seventeen years after the bombs dropped in Far Cry 5. A long nuclear winter has reshaped the world, and the survivors have put past actions behind them. Some citizens have banded together in John Seed’s former estate, now called Prosperity, while the converts to The Father’s religion are in New Eden, north of the original Project at Eden’s Gate compound. The rest of the map stretches to the southeast, ending at the old prison. 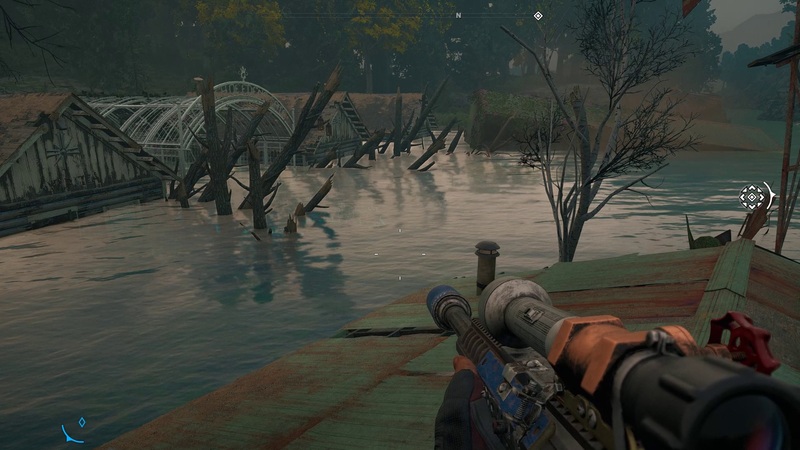 The smaller map brings a certain amount of focus for Far Cry: New Dawn. While Far Cry 5 had just above 60 main story missions and a ton of side missions, New Dawn has 22 story missions and 8 side missions in total. You can run through the whole thing in around 15-20 hours, which feels about just right. I recently argued that blockbuster games could do with a few more releases under 30 hours, so it’s good to immediately see one that fits the bill. New Dawn’s Hope County is around 50-60 percent of the Far Cry 5’s map, with the changes of nuclear fallout leading to a very different look. The lush green of the Montana wilderness has been replaced by an explosion of wild flowers in bright blue, neon pink, and a calming white. We’re so used to post-apocalyptic fiction having a drab brown color scheme that New Dawn feels immediately enticing with its striking color palette and graffiti-themed designs. Some areas, like Prosperity, which were on the flat lands are now mountainous regions. Former homes are ruined, covered by layers of dirt and undergrowth. Other regions that were relatively normal are now flooded by rising waters or covered in the desolation of the fallout. New Dawn benefits from the context of Far Cry 5. You can play it by itself, but many of the missions are a greatest hits of the locations you saw in FC5. The statue of the Father is a ruined husk that once burned forever due to the gas pipes and the flames caused by your actions in Far Cry 5. The bunker near John Seed’s ranch is a waterlogged mess, with fish and alligators living in its depths. The main street of Fall’s End is now a militarized outpost. I constantly found myself going, « Oh, I remember this location from this mission! » or « Oh right, this was this guy’s home! » Without that understanding of what came before, these are just locations, with no deeper meaning. The location can work without that familiarity, but it’s better when that’s a part of your experience. Ubisoft realizes this as well, as there are photo locations in the game when you match up an old world picture with a current location. The Guns for Hire return to help players out. Only one of the previous Guns return in New Dawn; Hurk Jr., who notes that he feels like he’s met you before, despite the fact that you’re a new character. Boomer is dead, replaced by a new dog named Timber. Pastor Jerome is one of your choices, wielding a mean shotgun and some molotovs, while Nick Rye’s daughter Carmina is your starting partner. My favorite was either Nana, a sniping grandma, or The Judge, a silent New Edener with a bow and arrow who I have a sneaking suspicion is supposed to be Rook, the main character of Far Cry 5. Much like Far Cry 5, you can outfit your character in various outfits found throughout the game. Unlike Far Cry 5, certain outfit pieces have a *chance* to drop when you take retake outposts or finish Expeditions, instead of being a guaranteed drop. This means you’re pushed to repeat that content if you want to finish a set, or… pay Far Cry Credits to buy those items outright. 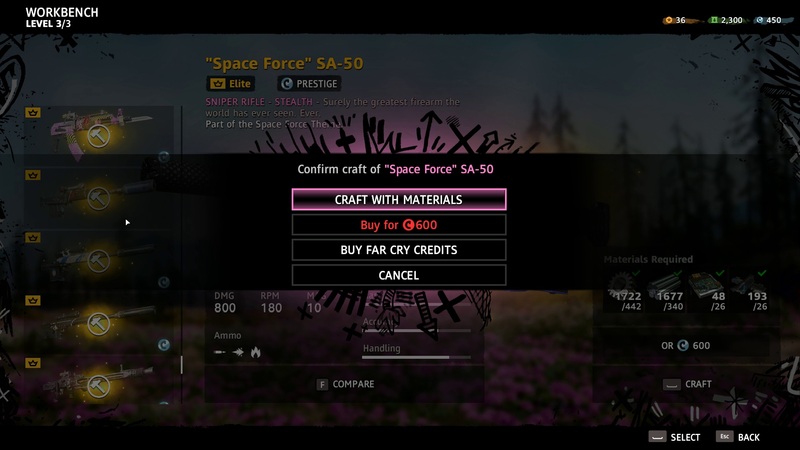 Speaking of microtransactions, Some, not all of the weapons are also available for Far Cry Credits, as an option instead of their normal material fees. The game gives you credits for free when you complete Treasure Hunts hidden around the map, but that only amounted to around 450 credits in my playthrough. That’s enough to buy a few clothing items, or one of the cheaper weapons. The weapon system doesn’t bother me much, but I can see the clothing system trying to move players towards picking up credits to finish off a set. Your character is a soldier working for Thomas Rush, a man who has brought together a group to help rebuild the United States. You’re attacked by the Highwaymen, a gang of raiders lead by The Twins, New Dawn’s version of the classic charismatic Far Cry antagonists. Mickey and Lou are two women who have succeeded in their father’s organization. They move their group from town to town, taking resources, killing those who step up to them, and living the good life. They’re anarchy in a world that’s trying to find some order. They mostly make their presence felt at the end of New Dawn’s three acts, chiding your character for standing up to them. I admit, like Far Cry 5, I felt a bit constrained by the situations that contrived to put you in a room with the Twins so they had a chance to shine, without either side dying in the process. While the Twins are the looming threat, the real meat of the narrative involves finishing the stories of those left behind from the previous game. The Rye family is one centerpiece, with Carmina being the impetus for Rush (and thus the player) coming to Hope County. 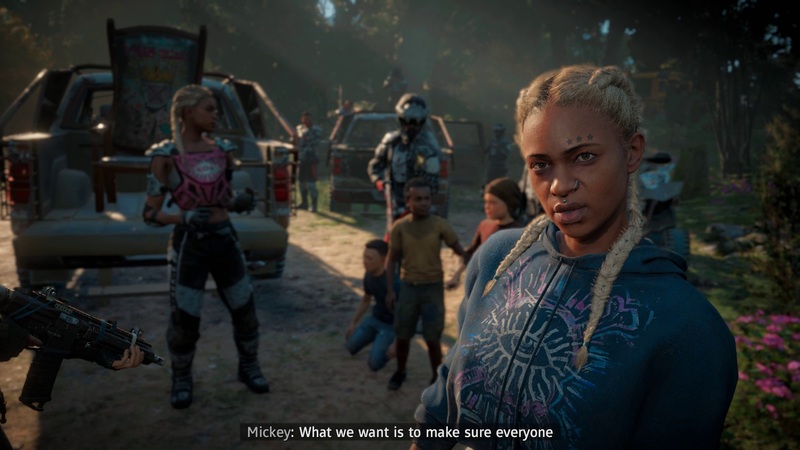 Nick has gone missing and Kim Rye, a minor character in FC5, is now the leader of Prosperity. Another focus involves what’s left of the Seed family and deals primarily with closure from Far Cry 5’s plot. The Father still lives, a man who has seen his prophecies come to pass, only to find the result not to his liking. More than anything, the ending of New Dawn is what I wanted from FC5, and I’m glad Ubisoft took the chance to finish off this story properly. New Dawn is still modern Far Cry at its core: you run, drive, fight, kill, skin, and loot your way across an open world. Shooting feels slightly better, but ultimately the same as previous games. New Dawn does switch things up with a new soft RPG progression system. As you take outposts, free prisoners, and take supply drops from the Highwaymen, you’re rewarded with resources, primarily ethanol. Ethanol is used to upgrade Prosperity, which has an overall level and several stations tied to your capabilities. Upgrading the weapon bench, gives you access to different stages of craftable weapons, while the Infirmary improves your overall health. You have to choose where to use your ethanol and other materials wisely, because early on they’re in limited supply. I’ve always been a fan of buildable home bases as a tangible representation of player progression, and Prosperity works in that regard. You know where you are, because you can literally see it in not only your home base, but also the weapons and vehicles you have at your disposal. Weapons and vehicles come in four levels that correspond to your enemies: Levels 1-3, and Elite. 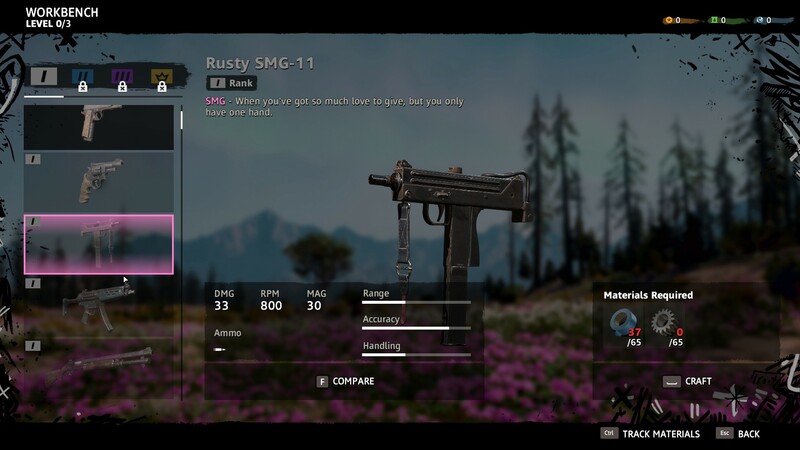 If you go up a level in crafting, you want to switch to the new weapons as soon as possible, as each level is nearly twice as strong as the one below it; you can kill a level 3 enemy with a level 2 gun, it’ll just take a while. I like the level ranges, but I wish Ubisoft had pushed weapons further. The addition of a few weapon modifications would be nice, and while some of the Elite weapons require unique resources obtained from mutated Monstrous animals, there’s only three of those here. Likewise, crafting materials could use a rethink, as animal hides feel even more useless here than in Far Cry 5. They’re traded in for all the other materials. I miss the days where the animal hides were used directly for crafting. You went hunting for three badger hides because that would allow you to craft a new pouch or weapon. So it’s a big step forward for progression, but a half-step back for crafting. Perhaps I’m expecting too much from a title with a more limited scope. All that said, Ubisoft does provide something brand new in New Dawn. While most of the game takes place in Hope County, Expeditions allow you to hop to other locations around the United States with the help of Québécois pilot Roger Cadoret. There are seven locations, including the Najavo Bridge, the desert wreck of International Space Station, and an aircraft carrier of the coast of California. Gameplay in the Expeditions is pretty straightforward-find a package, get back to the landing site, and survive-but they provide a change of scenery for New Dawn. 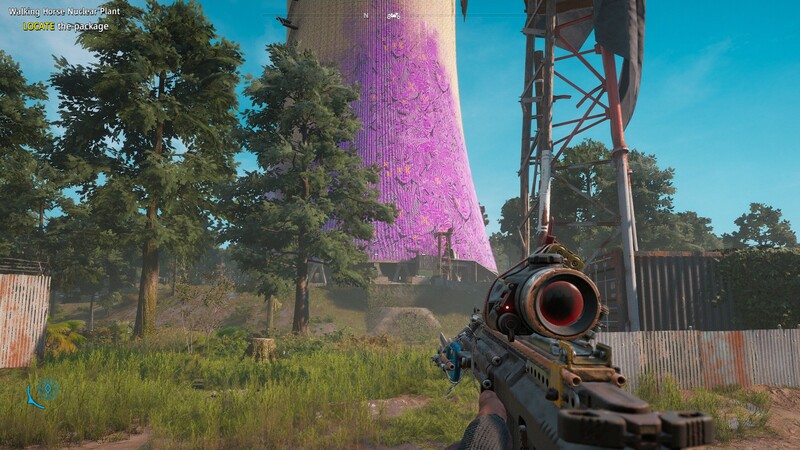 Yes, it looks striking, but seeing the deserts, swamps, or even an abandoned nuclear silo is a short pop of something fresh compared to the blue and pink wildflowers of Hope County. Expeditions are meant to be repeated multiple times, corresponding to the first three levels of the progression. Each level has a different starting point, time of day, package location, and general enemy level; but the rewards are just more materials, so after seeing them once or twice, there’s little reason to jump back in. You’ll get more materials from repeating enemy outposts. Outposts work like before: either sneak in or go in guns ablaze and kill at the enemy guards. This time, once you’ve taken an outpost, you can scavenge it for ethanol, ceding it back to the Highwaymen. When you go back, the outpost will have upgraded a level, with harder enemies and more alarms. The rewards for retaking an outpost are much better than Expeditions, and it’s easy to do if you’re keeping up with your weapons and Perks. I like the new outpost system, as it gives me a chance to flex my stealth muscles, but Expeditions could do with some unique rewards if Ubisoft wants to try the system again in the future. I generally enjoy the modern Far Cry games, but I admit I tend to love the cheaper alternate year entries more than the main games. 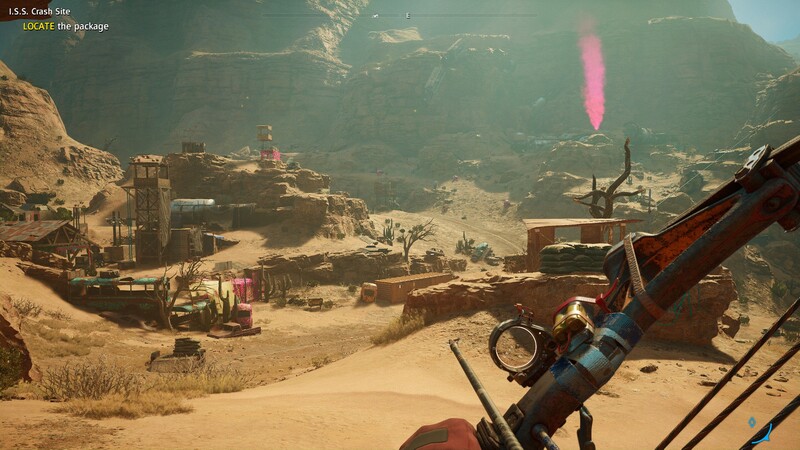 Far Cry: Blood Dragon, Far Cry: Primal, and now Far Cry: New Dawn benefit from not only the focus that comes with a smaller scope, but also the chance to play around with ideas compared to the main entries. The new RPG system and Expeditions are the foundation for excellent ideas that could be incorporated into future Far Cry titles. As foundations though, they need just a little more work and fleshing out to make them top-class. Unlike the completely standalone Blood Dragon and Primal, New Dawn finds its place in finishing the story that Far Cry 5 started. While a solid progression system, a wonderful visual style, and a short running time makes for a good game for those who haven’t played Far Cry 5, those who have played it will find more to love here. The name « New Dawn » might signal a new beginning, but for Far Cry 5 fans, it’s actually the proper ending. 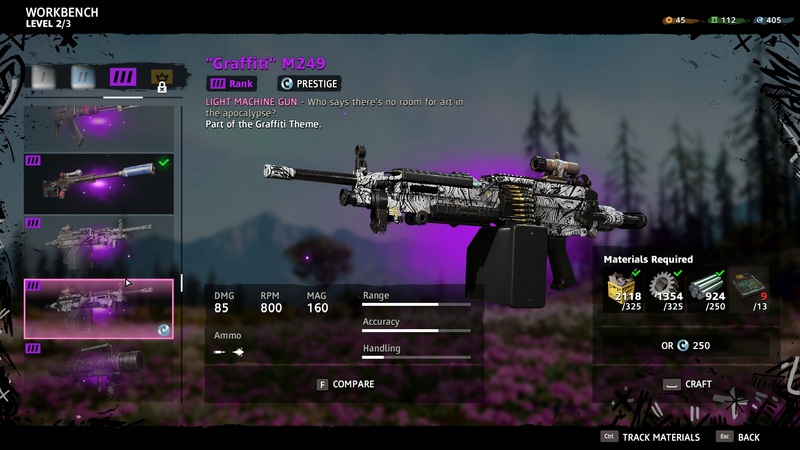 Far Cry: New Dawn cuts away some of the bloat of its predecessor Far Cry 5, to deliver a cleaner, more focused experience. The visual style breathes a good degree of life into a setting we’ve seen before, and Expeditions add more variety on top of that. The systems push you towards repeating content, but the boring rewards don’t back that up. And hunting, once one of the core parts of Far Cry, is mostly an afterthought here. Despite those problems, New Dawn’s short running time is a boon and the story provides closure to those who played the previous game. If you played and loved Far Cry 5, pick up New Dawn. If you didn’t, know that it’s still fun, but you’ll lose some of the context. Previous Post[Bon Plan] CrackDown 3 + PUBG Édition Fnac + Gears Of War 4 + Abonnement 6 mois au Xbox Live Gold à 59,99 euros !